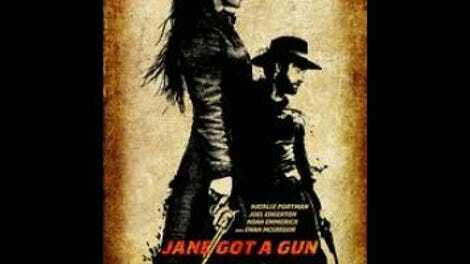 The post-Civil War Western Jane Got A Gun wastes no time getting to its premise. Early on, Jane Hammond (Natalie Portman) and her young daughter spy husband and father Bill (Noah Emmerich) approaching their modest home from a distance, on horseback. They’re excited to see him, until distress flashes across Jane’s eyes and Bill promptly slumps over and falls off his horse. It turns out he’s shot up with half a dozen bullets, just barely making it home alive. This brief sequence proceeds with an efficiency bordering on truncation; lingering a little bit on Bill’s slumped posture, or on Portman as she realizes not all is right, could have drawn out the moment effectively. But the movie leaves little time for grace notes in its delivery of plot information. On his way home, Bill ran into a gang led by John Bishop (Ewan McGregor, sporting a dark bad-guy mustache). He escaped, but Bishop and his greasy, gnarled band of maybe-brothers are searching for him, and will eventually find their way to the Hammond property, looking for as-yet-unspecified revenge. Bill is in no shape to help defend his family, so Jane rides into a nearby town and enlists the help of Dan Frost (Joel Edgerton, sporting a trim good-guy beard), her ex. He reluctantly agrees. As Jane and Dan fortify the homestead, a series of flashbacks fill in the soapy details of relationships between Jane, Bill, Dan, and Bishop. Director Gavin O’Connor (Warrior, also starring Edgerton) continues to move things along, conveying the potentially complicated backstory cleanly, though without much panache. Even when the movie focuses on its imagery rather than its plot mechanics, it seems intent on covering its bases rather than committing to a particular look or mood. Why show one sustained, striking shot of Portman on horseback when six different pretty good mashed-together shots might do the job? It’s hard to avoid wondering if the movie’s uninspired but watchable proficiency is Harvey Weinstein-mandated, given the movie’s troubled production history—O’Connor replaced director Lynne Ramsay, male leads rotated in and out of various parts, and eventual co-star Edgerton wound up helping to rewrite the screenplay—and the seemingly obligatory, unheralded theatrical release it’s now receiving. The finished film doesn’t play like a patchwork, but there are signs of cuts and stitches: a strange, abbreviated hot-air balloon sequence in one flashback, and McGregor’s role in general, especially the way it waffles around his degree of villainy. Bishop never seems less than dastardly, but the question of whether he’s self-servingly corrupt or a sociopathic outlaw either doesn’t interest the movie or was a casualty of story tweaks. In any case, the confusion gives the talented McGregor little to work with in a rare bad-guy role. As such, he doesn’t get to play off of his Attack Of The Clones co-stars (that odd bit of shared history that makes Emmerich feel even more like the odd man out). This is supposed to be Portman’s movie, and while she summons appropriate gunslinging grit (and, like Edgerton, looks sharp in a cowboy hat), she’s not allowed to fully command the screen in the way she should. Siege movies are often about the transition from collective passivity (something happening to the characters) to activity (the characters making decisions about how to defend themselves). At times, Jane Got A Gun comes perilously close to staying passive—to becoming A Gun Was Gotten By Jane. The film does dip into the experiences of grief, isolation, and survival in the Old West; maybe the Ramsay version would have waded in further. Here those moments pass quickly, leaving the movie to work only as a pulp programmer. It does that job moderately well, with charismatic stars, nice scenery, and an exciting shoot-out. But as-is, Jane Got A Gun cries out for, at very least, more stylish direction. The best O’Connor can do for a visual motif is a series of recurring shots where various characters gaze at Portman through dusty window panes. Visually speaking, these shots are simple, effective, and eventually underwhelming—a perfect match for the movie.